The Hanshaw Drive Garage site presents an opportunity to provide a much needed family homes on a presently vacant and under-utilised site. 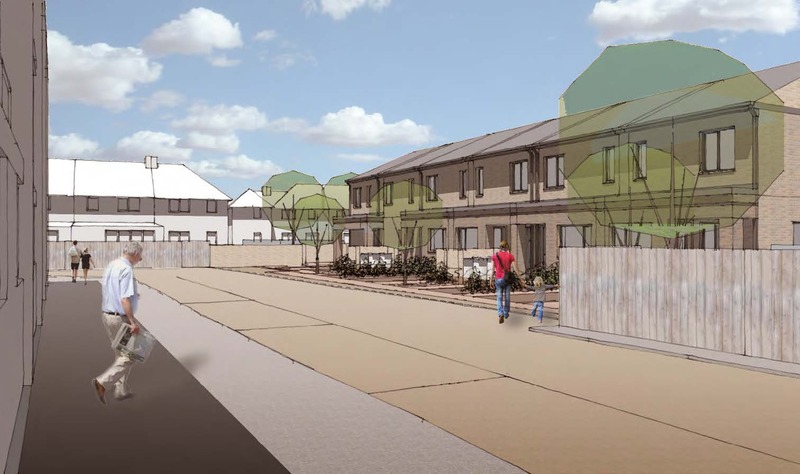 Our design maximises the potential of the site by improving its integration and surveillance, and by providing improved amenity space for residents. Four two-bedroom and one six-bedroom, wheelchair accessible terraces are proposed. The location of the terrace creates a clear and visible entrance to the site, with a shared surface to the west area of the principal access. The houses overlook the proposed car parking to provide natural surveillance. The homes are for affordable rent. All homes are dual aspect and generously sized in accordance with the London Housing SPG 2016. All have a private rear gardens (all greater than 40 sqm minimum) as well as planting to form a defensible space to the front aspect and entrance.